This week has been an emotional one! I learned early this week that my daughter and her partner along with my 6 month old grand-daughter will be moving cross-country because he has found a job. Although I am thrilled that he has found work, (he’s been unemployed for a while), I am saddened that they will be moving so far away. Currently they live an hour away in Denver and I’ve been averaging about a trip each week since she has been born just to hold and love on that sweet little girl. Now we will be back to video chatting at least once each week like we did when my daughter visited India for six months several years ago. That was nice, but it can never take the place of holding that sweet little bundle on my lap and repeatedly kissing those chubby little cheeks. If you are a grandparent, you know how I am feeling. We love our children with abundance, but when the grandchildren come around there is no feeling of love in the world that is greater. I’m not sure I can explain it. This week, after going to OnStage Las Vegas last weekend and looking at the retiring list, I decided to create a little project using some of the retiring card stock. Sorry, no video this month. I decided that gift tags are always a nice little thing to have on hand because I am always giving some sort of gift. Little 3 x 3 cards make the perfect gift tag size. You can punch a small hole in the top corner, add a piece of twine and tie them to a gift bag handle. Or you can place them into a small envelope and drop them inside the gift bag or attach them to the top of a wrapped gift. 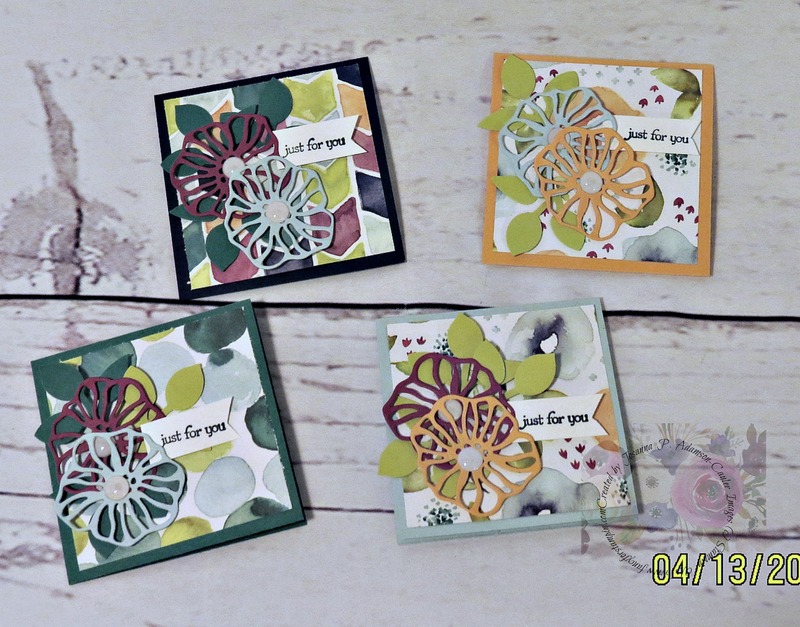 I chose to use the retiring 2016-2018 In Color card stock; specifically Peekaboo Peach and Emerald Envy. I could have used more, but I wanted to coordinate with the retiring Naturally Eclectic Designer Series Paper. So…I made a little gift of…gift tags! There are 4 in this set. Four 3 x 3 envelopes would fit perfectly in the wood crate box along with the cards. Heck, you could probably get 6 cards and envelopes in there. I also used Teeny Tiny Wishes stamp set. I’ve had this set for so long! Even though it is retiring, I will not part with it. It has always been my go to set when I needed just the right sentiment. It is so old, it’s wood mount. 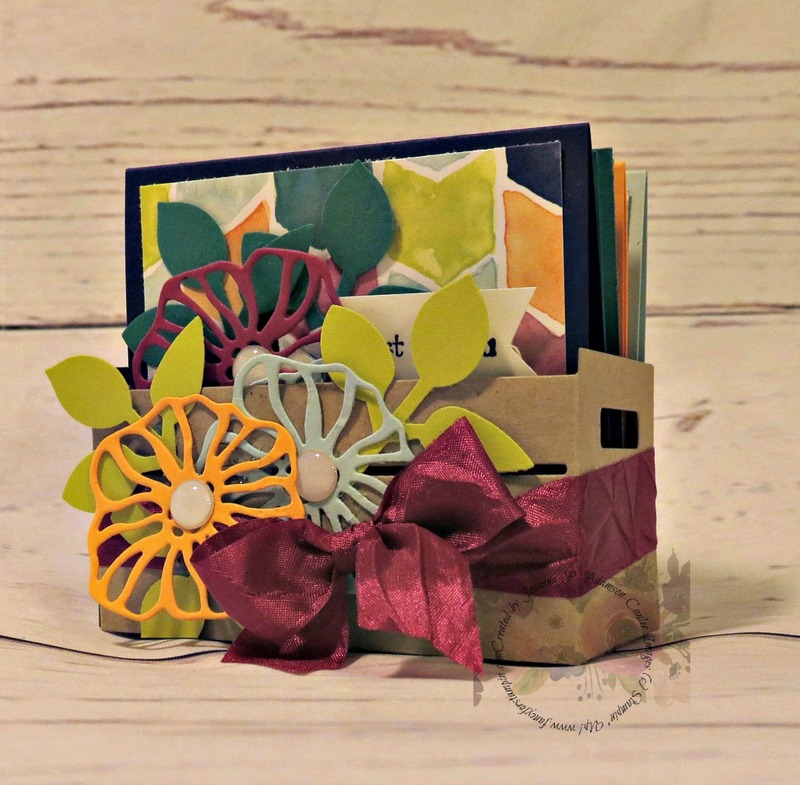 I bought it before Stampin’ Up! ever started offering anything other than wood mount. As soon as I’m allowed, I will post a list of the stamps sets I have that are retiring and will be for sale at 50% off their original price.